New Delhi: Recognizing that Thyroid diseases are, arguably, among the commonest endocrine disorders worldwide and its associated complications are amongst highest in the world, Public Health Foundation of India, an apex think-tank in South Asia, while releasing the Thyroid Factsheet, at AOTA 2017 in Busan, urged for an immediate need to create awareness and sensitize the medical community in the developing and the least developed countries about the need update on screening, treatment and management of thyroid disorders, and expanding the Certificate Course in Management of Thyroid Disorders (CCMTD) globally to expand capacity of over 5000 specialized and primary care physicians. About 200 million people in the world have some form of thyroid disease and according to a projection from various studies on thyroid disease, it has been estimated that about 42 million people in India suffer from thyroid diseases. Thyroid diseases are different from other diseases in terms of their ease of diagnosis, accessibility of medical treatment and the relative visibility that even a small swelling of the thyroid offers to the treating physician. Early diagnosis and treatment remains the cornerstone of management. Developing, Low and Middle Income countries account for a large percent of the global population that has thyroid disorders and the problem is more prevalent in women than men, where women diagnosed were found to have abnormal TSH levels compared men. Dr. Won Bae Kim AOTA Secretary in his address said, “It gives me immense pleasure to announce that there is a dedicated session of our AOTA endorsed thyroid course which PHFI is running in collaboration with Chellaram Diabetes Institute in India for the Doctors to enhance their skills in the diagnosis and management of thyroid disorders. AOTA fully supports this initiative and look forward to take this course to other Asian countries. PHFI’s Thyroid Capacity Building Program aims at expanding the professional capacity of General Physicians in the areas of research and development, medical education and awareness in Thyroid diseases in India and the South –South East Asia region. 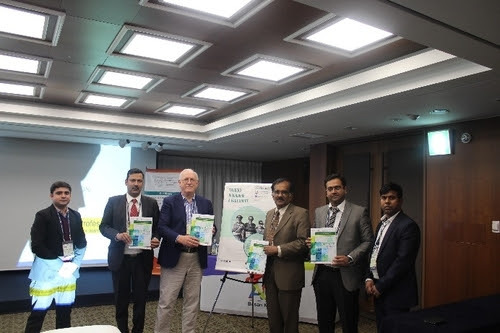 As part of this programme, more than 5,000 physicians in partnership with global partners and universities, in addition to Indian and South Asian states and countries, will benefit from accredited clinical and chronic diseases management training programmes. These programmes will equip clinicians with skills to avert Thyroid diseases and its related conditions in its early stages. The training division of Centre for Chronic Conditions and Injuries (CCCI) at PHFI runs several courses in the field of NCDs/CVD management, one of them being Certificate Course in Management of Thyroid Disorders (CCMTD). This is a pan-India course which is a unique 4 months executive on the job program that aims to build capacity amongst primary care physicians to address management, counselling, referral and prevention of Thyroid Disorders. Chellaram Diabetes Institute (CDI), Pune (India) is the academic partner, and the course is supported by an unrestricted educational grant from GSK India. CCMTD is presently conducted in 35 regional centers of India spread across 18 states, 2 Union Territories (UTs) and 30 cities. The course has received an overwhelming response and a total of 2460 primary care physicians have been trained over the period of three cycles. The course curriculum has been vetted by a panel of 15 national experts that comprise of the renowned endocrinologists of India. It is a 4 modular course has been designed to be delivered once-a-month through contact session on a designated weekend. The course is administered by regional faculty who are eminent endocrinologists of their respective cities.